I was up working in what were in my part of the world the early morning hours of March 11, 2011, when I heard over the radio that a massive earthquake had struck northeastern Japan. I turned on the TV just in time to see the earliest pictures of the tsunami that followed what became known as the Tohoku quake. The devastation was instantly apparent, and reports of high numbers of casualties seemed inevitable, but it wasn’t until a few hours later, when news of the destruction and loss of power at the Fukushima Daiichi nuclear plant hit the English-language airwaves, that I was gripped by a real sense of despair. I was far from a nuclear expert at the time, but I knew enough to know that without intact cooling systems, or the power to keep them running, and with the added threat of a containment breach, some amount of environmental contamination was certain, and the potential for something truly terrifying was high. What started as a weekend of watching newswires and live streams, virtually around the clock, and posting basic tech and health questions on email lists, expanded as the Fukushima crisis itself grew. Two years later, I have written tens of thousands of words, and read hundreds of thousands more. I have learned much, but I think I have only scratched the surface. We all might be a little closer to understanding what happened in those first days and weeks after the earthquake, but what has happened since is still, sadly, a story where much must be written. What the Daiichi plant workers really went through in those early days is just now coming to light, and the tales of intrigue and cover-up, of corruption and captured government, grow more complex and more sinister with each revelation. But what has happened to the environment, not just in the government-cordoned evacuation zone, but also throughout Japan, across the Pacific, and around the world, will likely prove the most chilling narrative. Radiation levels in the quarantined parts of Japan are still far too high to permit any kind of human re-habitation, but exposure rates in areas far outside that radius are also well above what would have been considered acceptable before this disaster. And water, used to cool the molten cores and damaged spent fuel pools at Fukushima Daiichi, now dangerously radioactive itself, continues to leak into the ground and into the ocean at unprecedented rates. Alas, the efforts of the Japanese government seem more focused on limiting the information, quieting dissent, and sharing the pain (by shipping radioactive detritus across the country for disposal and incineration), than it is on stopping the leaks, cleaning up the contamination, and eliminating future risks. Though originally pledged to quickly turn away from all nuclear power, a change of government in Japan has revived the incestuous relationship between the nuclear industry and the bureaucrats and politicians who are supposed to police it. Across the Pacific, the United States has not exactly bathed itself in glory, either. Within days of the news of the explosions at Fukushima, President Barack Obama was the rare world leader that made a point of publicly assuring the nuclear industry that America’s commitment to this dangerous energy source was still strong. Just months after the start of the crisis, information on airborne radiation samples from across the country became less accessible to the public. And while industrialized countries like Germany work to phase out their nuclear plants, the US Nuclear Regulatory Commission actually approved construction of new reactors, and the federal government is poised to backstop the baldly risky investment to the tune of $8.3 billon. But most disturbing of all, of course, will be the stories of the people. First, the stories we will hear from the families in Japan exposed to the toxic fallout in the immediate aftermath of the initial containment breaches and explosions–stories we are already hearing of children with severe thyroid abnormalities. But soon, and likely for decades to come, the stories of cancers and immune disorders, of birth defects and health challenges, elevated not only in northern Japan, but perhaps across the northern hemisphere. Two years after the earthquake and tsunami, it is not the beginning of the end of this disaster, and, with apologies to Winston Churchill, it may not even be the end of the beginning. The spent fuel pool at Daiichi reactor 4 remains in precarious shape, and the state of the three molten cores is still shrouded in mystery. Radioactive dust and grime blanket large parts of Japan with no serious plan to remove it, and the waters off the northeast coast continue to absorb irradiated runoff, putting an entire aquatic food chain in peril. 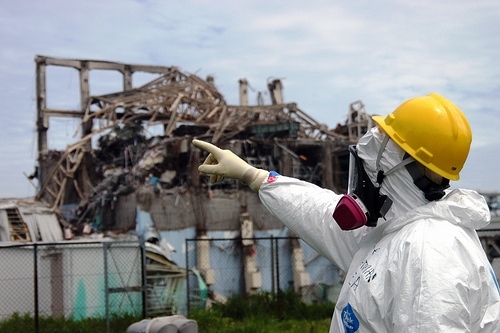 On this second anniversary of the start of the Fukushima crisis, let us honor those who have suffered so far, review what we have learned to date, and endeavor to understand what is likely to come. But, most of all, let us renew our commitment to breaking with this dirty, dangerous and expensive technology. To this end, on March 11 and 12, I will be attending a symposium at the New York Academy of Medicine, “The Medical and Ecological Consequences of the Fukushima Nuclear Accident,” sponsored by the Helen Caldicott Foundation and Physicians for Social Responsibility. If you are in the New York area, there is still space available; if you want to watch online, the organizers have promised a live stream. More information can be found on the Caldicott Foundation website. A frame from early in the newly released Fukushima video. 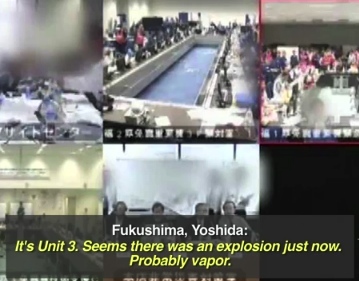 Though incomplete, the footage from a concrete bunker at the plant confirms what many had long suspected: that the Tokyo Electric Power Company, the plant’s operator, knew from the early hours of the crisis that multiple meltdowns were likely despite its repeated attempts in the weeks that followed to deny such a probability. It also suggests that the government, during one of the bleakest moments, ordered the company not to share information with the public, or even local officials trying to decide if more people should evacuate. Above all, the videos depict mayhem at the plant, a lack of preparedness so profound that too few buses were on hand to carry workers away in the event of an evacuation. They also paint a close-up portrait of the man at the center of the crisis, Mr. Yoshida, who galvanizes his team of engineers as they defy explosions and fires — and sometimes battle their own superiors. That summary is from New York Times Tokyo-based reporter Hiroko Tabuchi. The story she tells is compelling and terrifying, and focuses on the apparent heroism of Masao Yoshida, Fukushima’s chief manager when the crisis began, along with the far less estimable behavior of TEPCO and Japanese government officials. It is worth a couple of your monthly quota of clicks to read all the way through. The story is but one take on the video, and I point this out not because I question Tabuchi’s reporting on its content, much of which is consistent with what is already known about the unholy alliance between the nuclear industry and the Japanese government, and about what those parties did to serve their own interests at the expense of the Japanese people (and many others across the northern hemisphere). Instead, I bring this up because I do not myself speak Japanese, and I am only allowed to view a 90-minute “highlight reel” and not the entire 150 hours of video, and so I am dependent on other reporters’ interpretations. And because neither TEPCO nor the Japanese government (which now essentially owns TEPCO) has yet proven to be completely open or honest on matters nuclear, the subtle differences in those interpretations matter. Tabuchi took to Twitter to say how much she wanted to tell the story as “a tribute to Fukushima Daiichi chief Yoshida and the brave men on the ground who tried to save us.” But in a separate tweet, Tabuchi said she was “heartbroken” to discover her article was cut in half. Editing is, of course, part of journalism. Trimming happens to many stories in many papers. But I had to raise an eyebrow when I saw a note at the bottom of Tabuchi’s piece that said Matthew Wald “contributed reporting from Washington.” I have previously been critical of Wald–a Times veteran, contributor to their Green blog, and often their go-to reporter on nuclear power–for stories that sometimes read like brochures from the Nuclear Energy Institute. Wald tends to perpetuate myths in line with the old “clean, safe, and too cheap to meter” saw, while reserving a much, uh, healthier (?) skepticism for nuclear power critics and renewable energy advocates. Despite the close-up view of the disaster, the videos — which also capture teleconferences with executives in Tokyo — leave many questions unresolved, in good part because only 50 of 150 hours include audio. The company blamed technical problems for the lack of audio. Tepco has bowed to pressure to release 150 hours of teleconferencing footage but the tape was heavily edited and mostly muted to “protect employees’ privacy”. Tepco is again under criticism for not releasing the full recordings and has been asked if it was removing more than employees’ names and phone numbers. Japan’s former prime minister criticized the tsunami-hit nuclear plant’s operator Wednesday for heavily editing the limited video coverage it released of the disaster, including a portion in which his emotional speech to utility executives and workers was silenced. Naoto Kan called for Tokyo Electric Power Co. to release all of its video coverage, beyond the first five days. Two-thirds of the 150 hours of videos it released Monday are without sound, including one segment showing Kan’s visit to the utility’s headquarters on March 15 last year, four days after a tsunami critically damaged three reactors at the Fukushima Dai-ichi power plant. Many people’s faces, except for the plant chief and top executives in Tokyo, are obscured in the videos and frequent beeps mask voices and other sound. The AP story also points out that the released video arbitrarily ends at midnight on March 15–and though it is not known how much more tape exists, it appears clear that TEPCO has held some substantial portion back. After five days, the Fukushima crisis was far from over, after all (as it is still far from over), and the recordings end amidst some of the disaster’s most critical events. But the New York Times omits all of this, leaving TEPCO’s Rose Mary Woods-like excuse to stand as the innocent truth. Plant managers and TEPCO officials were aware from the earliest hours of the crisis that they were likely facing multiple meltdowns. Japanese government officials withheld information–and ordered TEPCO to withhold information–on radiation levels that could have helped untold numbers of civilians reduce their exposure. Despite warnings years prior that such natural disasters were possible in the region, Fukushima operators had no plan to deal with the damage and loss of power caused by the quake and tsunami. TEPCO did not even have the infrastructure or procedures in place to evacuate its own employees from an imperiled facility. Plant officials were–from the earliest days–as worried about the spent fuel pools as they were about the reactors. Those on the scene feared that most of the pools at Daiichi, not just the one at reactor four, were facing loss of coolant and the fires and massive radiation leaks that would follow, though publicly they said none of the pools were a danger at the time. And there is more about the dire conditions for plant workers, the lack of food or water, the high levels of radiation exposure, and even a point where employees had to pool their cash to buy water and gasoline. And, as noted above, that’s just the part TEPCO has deemed acceptable for release. Above all, though–beyond the discrepancies in reporting, beyond the moral failings of TEPCO and government officials, beyond the heroism of those at the crippled facility–what the new Fukushima tapes reveal is what those who watch the nuclear industry have mostly known all along. Nuclear power is dangerous–the radiation, the complexity of the system, the waste, the reliance on everything going right, and the corrupt conspiracy between industry and government saddle this form of energy production with unacceptable risks. The video now available might shed some light on how things at Fukushima went horribly wrong, but the entire world already knows plenty of who, what, where and when. We all know that things at Fukushima did go horribly wrong, and so many know that they must suffer because of it. What must be admitted – very painfully – is that this was a disaster “Made in Japan.” Its fundamental causes are to be found in the ingrained conventions of Japanese culture: our reflexive obedience; our reluctance to question authority; our devotion to ‘sticking with the program’; our groupism; and our insularity. That this apparently critical self-examination was seized upon by much of the western media’s coverage of the report probably does not come as a surprise–especially when you consider that this revelation falls within the first 300 words of an 88-page document. Cultural stereotypes and incomplete reads are hardly new to establishment reportage. What might come as a shock, however, is that this painful admission is only made in the English-language version of the document, and only in the chairman’s introduction is the “made in Japan” conclusion drawn so specifically. What replaces the cultural critique in the Japanese edition and in the body of the English summary is a ringing indictment of the cozy relationship between the Japanese nuclear industry and the government agencies that were supposed to regulate it. This “regulatory capture,” as the report details, is certainly central to the committee’s findings and crucial to understanding how the Fukushima disaster is a manmade catastrophe, but it is not unique to the culture of Japan. Indeed, observers of the United States will recognize this lax regulatory construct as part-and-parcel of problems that threaten the safety and health of its citizenry, be it in the nuclear sector, the energy sector as a whole, or across a wide variety of officially regulated industries. The Japanese Diet’s Fukushima report includes a healthy dose of displeasure with the close ties between government regulators and the nuclear industry they were supposed to monitor. The closed, insular nature of nuclear oversight that might be attributed to Japanese culture by a superficial read is, in fact, a product of the universally familiar “revolving door” that sees industry insiders taking turns as government bureaucrats, and regulatory staff “graduating” to well-compensated positions in the private sector. A disturbing betrayal of accountability in any context, it is especially troubling with the ominous repercussions of the Fukushima disaster still metastasizing. And it is also ominously familiar. [San Onofre Nuclear Generating Station] was chastised two years ago by the U.S. Nuclear Regulatory Commission for creating an atmosphere in which employees fear retaliation if they report safety concerns. Edward Bussey, a former health physics technician at the plant, sued Edison in state court after he was fired in 2006 under what he said were trumped-up charges that he had falsified initials on logs documenting that certain materials had been checked for radiation. Bussey contended that he was really fired in retaliation for complaining about safety concerns to his supervisors and the NRC. San Onofre is majority owned and operated by Southern California Edison, a private company, but it sits on land leased from the Camp Pendleton Marine Corps base. That puts the plant in a so-called federal enclave, where courts have held that many California laws, including labor laws intended to protect whistle-blowers, do not apply. Lawsuits filed in state court by San Onofre workers who claimed that they were fired or retaliated against for reporting safety concerns, sexual harassment and other issues have been tossed out because of the plant’s location. The Los Angeles Times cites examples dating back to the construction of San Onofre where personnel who complained about safety or work conditions were terminated and left without many of the legal options normally afforded most California citizens. The history of SONGS is liberally peppered with accidents and safety breaches–and the lies and cover-ups from its owner-operators that go with them. Considering that San Onofre employees are regularly punished for exposing problems and have fewer whistleblower protections, is it at all surprising that SONGS is reported to have the worst safety record of all US nuclear plants? If San Onofre’s track record isn’t evidence enough of the dangers of weak regulation, the findings and conclusions of the latest Fukushima report make it crystal clear: “safety culture” is not undermined by Japanese culture so much as it is by the more international culture of corruption born of the incestuous relationship between industry and regulators. But the corrupt culture–be it national or universal–is itself a bit of a dodge. As noted by the Financial Times, the Japanese and their regulatory structure have managed to operate the technologically complex Shinkansen bullet trains since 1964 without a single derailment or fatal collision. As the Diet’s report makes abundantly clear–far more clear than any talk about Japanese culture–the multiple failures at and around Fukushima Daiichi were directly related to the design of the reactors and to fatal flaws inherent in nuclear power generation. Return for a moment to something discussed here last summer, The Light Water Paradox: “In order to safely generate a steady stream of electricity, a light water reactor needs a steady stream of electricity.” As previously noted, this is not some perpetual motion riddle–all but one of Japan’s commercial nuclear reactors and every operating reactor in the United States is of a design that requires water to be actively pumped though the reactor containment in order to keep the radioactive fuel cool enough to prevent a string of catastrophes, from hydrogen explosions and cladding fires, to core meltdowns and melt-throughs. Most of the multiple calamities to befall Fukushima Daiichi have their roots in the paradox. As many have observed and the latest Japanese report reiterates, the Tohoku earthquake caused breaches in reactor containment and cooling structures, and damaged all of Fukushima’s electrical systems, save the diesel backup generators, which were in turn taken out by the tsunami that followed the quake. Meeting the demands of the paradox–circulating coolant in a contained system–was severely compromised after the quake, and was rendered completely impossible after the tsunami. Given Japan’s seismic history, and the need of any light water reactor for massive amounts of water, Fukushima wouldn’t really have been a surprise even if scientists hadn’t been telling plant operators and Japanese regulators about these very problems for the last two decades. [Each of San Onofre’s steam generators has] 9,727 U-shaped tubes inside, each three-quarters of an inch in diameter. The alloy tubes represent a critical safety barrier — if one breaks, there is the potential that radioactivity could escape into the atmosphere. Also, serious leaks can drain protective cooling water from a reactor. Gradual wear is common in such tubing, but the rate of erosion at San Onofre startled officials since the equipment is relatively new. The generators were replaced in a $670 million overhaul and began operating in April 2010 in Unit 2 and February 2011 in Unit 3. Tubes have to be taken out of service if 35 percent — roughly a third — of the wall wears away, and each of the four generators at the plant is designed to operate with a maximum of 778 retired tubes. In one troubled generator in Unit 3, 420 tubes have been retired. The records show another 197 tubes in that generator have between 20 percent and 34 percent wear, meaning they are close to reaching the point when they would be at risk of breaking. More than 500 others in that generator have between 10 percent and 19 percent wear in the tube wall. [SONGS] has plugged 3.7 times as many steam generator tubes than the combined total of the entire number of plugged replacement steam generator tubes at all the other nuclear power plants in the US. The report also explains that eight of the tubes failed a “pressure test” at San Onofre, while the same test at other facilities had never triggered any more than one tube breach. Fairewinds goes on to note that both units at San Onofre are equally precarious, and that neither can be restarted with any real promise of safe operation. And while the rapid degeneration of the tubing might be peculiar to San Onofre, the dangers inherent in a system that requires constant power for constant cooling–lest a long list of possible problems triggers a toxic crisis–are evident across the entire US nuclear fleet. Cracked containment buildings, coolant leaks, transformer fires, power outages, and a vast catalogue of human errors fill the NRC’s event reports practically every month of every year for the past 40 years. To put it simply, with nuclear power, too much can go wrong when everything has to go right. And this is to say nothing of the dangers that come with nuclear waste storage. Like with the reactors, the spent fuel pools that dot the grounds of almost every nuclear plant in America and Japan require a consistent and constantly circulating water supply to keep them from overheating (which would result in many of the same disastrous outcomes seen with damaged reactors). At Fukushima, one of the spent fuel pools is, at any given point, as much of a concern as the severely damaged reactor cores. Ions and tigers and bears, oh my! Even with the latest findings, however, Japanese Prime Minister Yoshihiko Noda pushed ahead with the restart of the precariously situated and similarly flawed nuclear reactor complex at Oi. It is as if the PM and the nuclear industry feared Japan surviving another summer without nuclear-generated electricity would demonstrate once and for all that the country had no reason to trade so much of its health and safety for an unnecessary return. And maybe there’s where cultural distinctions can be drawn. In Japan, the citizenry–especially women–are not demonstrating “reflexive obedience,” instead, they are demonstrating. In the United States, where 23 nuclear reactors are of the same design as Fukushima Daiichi, and 184 million people within 50 miles of a nuclear power plant, when the chairman of the Nuclear Regulatory Commission suggested requiring some modest upgrades as a response to the Fukushima disaster, the nuclear industry got its henchmen on the NRC and in Congress to push him out. . . with little public outcry. Still, the BBC’s Mariko Oi lamented on the day the Fukushima report was released that Japanese media was paying more attention to the birth of a giant panda at a Tokyo zoo. That sort of response would seem all too familiar to any consumer of American media. That baby panda, it should be noted, has since died. The radioactive fallout from Fukushima, however, lingers, and the crisis at Daiichi is far from over. The threat to global heath and safety that is unique to nuclear power lives on. In all fairness, “Inside Japan’s Nuclear Meltdown,” the Frontline documentary that debuted on US public television stations last night (February 28), sets out to accomplish an almost impossible task: explain what has happened inside and around Japan’s Fukushima Daiichi nuclear facility since a massive earthquake and tsunami crippled reactors and safety systems on March 11, 2011–and do so in 53 minutes. The filmmakers had several challenges, not the least of which is that the Fukushima meltdowns are not a closed case, but an ever-evolving crisis. Add to that the technical nature of the information, the global impact of the disaster, the still-extant dangers in and around the crippled plant, the contentious politics around nuclear issues, and the refusal of the Tokyo Electric Power Company (TEPCO) to let its employees talk either to reporters or independent investigative bodies, and it quickly becomes apparent that Frontline had a lot to tackle in order to practice good journalism. But if the first rule of reporting is anything like medicine–“do no harm”–than Frontline’s Fukushima coverage is again guilty of malpractice. While “Inside Japan’s Nuclear Meltdown” is not the naked apologia for the nuclear industry that Frontline’s January offering, “Nuclear Aftershocks,” was, some of the errors and oversights of this week’s episode are just as injurious to the truth. And none more so than the inherent contradiction that aired in the first minutes of Tuesday’s show. The earthquake that shook the Fukushima Dai-ichi nuclear power plant was the most powerful to strike Japan since records began. The company that operates the plant, TEPCO, has forbidden its workers from speaking publicly about what followed. But one year on, they are starting to tell their stories. Some have asked for their identities to be hidden for fear of being fired. The workers stayed calm because they knew Japanese power plants are designed to withstand earthquakes. The reactors automatically shut down within seconds. But the high radioactivity of nuclear fuel rods means they generate intense heat even after a shutdown. So backup generators kicked in to power the cooling systems and stop the fuel rods from melting. The biggest of the waves was more than 40 feet high and traveling at over 100 miles an hour. At 3:35 PM, the biggest of the waves struck. It was more than twice the height of the plant’s seawall. Most of the backup diesel generators needed to power the cooling systems were located in basements. They were destroyed by the tsunami waters, meaning the workers had no way of keeping the nuclear fuel from melting. The impression left for viewers is that while the quake knocked out Fukushima’s primary power, the diesel backup generators were effectively cooling the reactors until the tsunami flooded the generators. It’s a good story, as stories go, and one that TEPCO and their nuclear industry brethren are fond of telling to anyone and everyone within the sound of their profit-enhanced, lobbyist-aided voices. They have told it so often that it seems to be part of the whole Fukushima narrative that less-interested parties can recount without so much as glancing at their talking points. Indeed, even Frontline’s writers thought they could toss it out there without any debate and then move on. One problem with that story, though–it’s not true. I personally saw pipes that had come apart and I assume that there were many more that had been broken throughout the plant. There’s no doubt that the earthquake did a lot of damage inside the plant… I also saw that part of the wall of the turbine building for reactor one had come away. That crack might have affected the reactor. Those are the words of a Fukushima maintenance worker who requested anonymity when he told his story to reporters for Great Britain’s Independent last August. That worker recalled hissing, leaking pipes in the immediate aftermath of the quake. Someone yelled that we all needed to evacuate. But I was severely alarmed because as I was leaving I was told and I could see that several pipes had cracked open, including what I believe were cold water supply pipes. That would mean that coolant couldn’t get to the reactor core. If you can’t sufficiently get the coolant to the core, it melts down. You don’t have to have to be a nuclear scientist to figure that out. Workers also describe seeing cracks and holes in reactor one’s containment building soon after the earthquake, and it has been reported that a radiation alarm went off a mile away from Fukushima Daiichi at 3:29 PM JST–43 minutes after the quake, but 6 minutes before the tsunami hit the plant’s seawall. He says the released data shows that at 2.52pm, just after the quake, the emergency circulation equipment of both the A and B systems automatically started up. “This only happens when there is a loss of coolant.” Between 3.04 and 3.11pm, the water sprayer inside the containment vessel was turned on. Mr Tanaka says that it is an emergency measure only done when other cooling systems have failed. By the time the tsunami arrived and knocked out all the electrical systems, at about 3.37pm, the plant was already on its way to melting down. In fact, these conclusions were actually corroborated by data buried in a TEPCO briefing last May–and they were of course corroborated by “Ono” in the opening minutes of Frontline’s report–but rather than use their documentary and their tremendous access to eyewitnesses as a way of starting a discussion about what really went wrong at Fukushima Daiichi, Frontline instead moved to end the debate by repeating the industry line as a kind of shorthand gospel. This is not nitpicking. The implications of this point–the debate about whether the nuclear reactor, its cooling systems and containment (to say nothing yet of its spent fuel pools and their safety systems) were seriously damaged by the earthquake–are broad and have far-reaching consequences for nuclear facilities all over the globe. To put it mildly, the pipes at Fukushima were a mess. Over the decade prior to the Tohoku quake, TEPCO was told repeatedly about the poor state of the plant’s pipes, ducts, and couplings. Fukushima was sighted numerous times for deteriorating joints, faked inspections and shoddy repairs. Technicians talk of how the systems didn’t match the blueprints, and that pipes had to be bent to match up and then welded together. Fukushima was remarkably old, but it is not remarkable. Plants across Japan are of the same generations-old design. So are many nuclear reactors here in the United States. If the safety systems of a nuclear reactor can be dangerously compromised by seismic activity alone, then all of Japan’s reactors–and a dozen or more across the US–are one good shake away from a Fukushima-like catastrophe. And that means that those plants need to be shut down for extensive repairs and retrofits–if not decommissioned permanently. The stakes for the nuclear industry are obviously very high. You can see how they would still be working overtime to drown out the evidence and push the “freak one-two punch” narrative. But it’s not the true story–indeed, it is dangerous lie–so it is hard to reconcile why the esteemed and resourceful journalists at Frontline would want to tell it. That was not the only problem with Tuesday’s episode, but it is one of the most pernicious–and it presents itself so obviously right at the start of “Inside Japan’s Nuclear Meltdown.” Also problematic was the general impression left at the end of the program. While mention is made of the 100,000 displaced by the 12-mile Fukushima exclusion zone, nothing is said about the broader health implications for the entre country–and indeed for the rest of the world as radioactive isotopes from Fukushima spread well beyond Japan’s borders. Alas, though Frontline tells of the massive amounts of seawater pumped into the damaged facility, nothing much is said about the contaminated water that is leaving the area, spreading into groundwater, rivers and the Pacific Ocean. The show talks of the efforts to open a valve to relieve pressure inside one reactor, but does not address growing evidence that the lid of the containment vessel likely lifted off at some point between the tsunami and the explosion in building one. And there is a short discussion of bringing the now-melted-down reactors to “cold shutdown,” but there is no mention of the recent “re-criticality“–the rising temperatures inside one of the damaged cores. And to that point–and to a point often made in these columns–this disaster is not over. “Japan’s Meltdown” is not in the past–it is still a dangerous and evolving crisis. The “devil’s chain reaction” that could have required the evacuation of Tokyo is still very much a possibility should another earthquake jolt the region. . . which itself is considered likely. Sadly–disturbingly–Frontline’s Fukushima tick-tock ends leaving the opposite impression. They acknowledge the years of work that lie ahead to clean up the mess, but the implication is that the path is clear. They acknowledge the tragedy, but treat it as does one of the film’s subjects, who is shown at Frontline’s end at a memorial for his lost family–it is something to be mourned, commemorated and honored. But Fukushima’s crisis is not buried and gone, and though radioactive water has been swept out to sea and radioactive fallout has been blown around the world, the real danger of Fukushima Daiichi and nuclear plants worldwide is not gone with the wind. As noted above, it is a difficult task to accurately and effectively tell this sweeping story in less than an hour–but the filmmakers should have acknowledged that and either refocused their one show, or committed to telling the story over a longer period of time. Choosing instead to use the frame of the nuclear industry and the governments that seek its largess is not good journalism because it has the potential to do much harm. 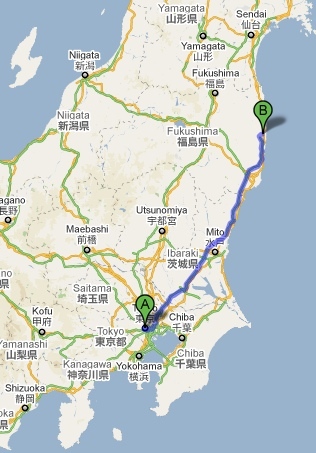 Map of the east coast of Japan showing the distance between Tokyo and Fukushima Daiichi, 150 miles to the north. A new independent report on the Fukushima Daiichi Nuclear disaster reveals that Japan’s Prime Minister Naoto Kan feared events following the March 11, 2011 Tohoku earthquake and tsunami would require the evacuation of Tokyo. The report, conducted by the Rebuild Japan Foundation, a new policy organization comprised of college professors, journalists and lawyers, sheds new light on just how in-the-dark many were in the wake of natural disasters that left the Fukushima nuclear facility with damaged safety systems and without internal or external power. The investigation underscores the conflicting interests of the Japanese government, the directors of Tokyo Electric Power Company (TEPCO–Fukushima’s owner and operator), and those on the scene at the crippled nuclear plant. Masataka Shimizu, president of TEPCO, is said to have ordered all of Fukushima Daiichi’s employees to evacuate the facility in the days after March 11, but Daiichi’s plant manager, Massao Yoshida, argued that he could get the damaged reactors under control if he and nuclear workers remained. PM Kan eventually ordered a skeleton crew to stay at the plant, fearing that Fukushima Daiichi, the nearby Fukushima Daini and a third nuclear facility could spiral out of control and start what has been translated as a “devil’s chain reaction” or a “demonic chain reaction” that would necessitate evacuation of the nation’s capital, a city of 13 million people, 150 miles south of Fukushima prefecture. Given this new window on internal deliberations (far too nice a word–these were likely frantic, heated arguments) in Japan, the decision made by US Nuclear Regulatory Commission Chairman Gregory Jaczko within days of the quake to recommend evacuating American citizens from an area 50 miles around Fukushima seems downright conservative. In recent days, nuclear power proponents have used this action as their latest volley in their ongoing push to oust Jaczko and replace him with a more servile chief regulator. Other recent revelations–about how close Fukushima Daini came to a meltdown of its own, about how the Fukushima region is now more seismically unstable, and that the government had dire assessments of the disaster that it worked hard to keep secret–serve to buttress Naoto Kan’s fears that a string of nuclear disasters was a distinct possibility. And it should also serve as a warning that those fears are still a possibility if the region’s nuclear plants–whether or not they are still functioning–are not decommissioned and contained. And all this information, and the new details on the lack of trust between the Japanese government and TEPCO, also paints a more nuanced–and, honestly, disturbing–picture of the environment in which US officials had to make decisions. But, perhaps most importantly, this latest report is yet another data point against the absurd assertion that Fukushima Daiichi somehow proves nuclear power’s “defense in depth” safety systems work. The assertion that Fukushima isn’t a massive disaster, just as it stands today, is ridiculous, but reading about the lack of good information in the early days of the crisis, the internal fights and the government’s fears makes it clear that things could have easily been much, much worse. While there are still real concerns about just how much radiation residents throughout Japan will be expected to absorb, and there are still many technical questions that remain unanswered, it now appears that it was only a combination of an occasionally assertive PM, the heroism of about fifty Daiichi workers and maybe some dumb luck that gave the world the relative luxury of calling Fukushima an ever-metastasizing disaster, rather than an almost-instant hell on earth. To paraphrase the United States Nuclear Regulatory Commission, Merry Effin’ Christmas. In a news dump that came a day early (because who really wants to dump on Christmas-Eve Eve? ), the Nuclear Regulatory Commission made a pair of moves Thursday that could have significant consequences for America’s nuclear industry–and all the people who have to live with it. The Nuclear Regulatory Commission unanimously approved a radical new reactor design on Thursday, clearing away a major obstacle for two utilities to begin construction on projects in South Carolina and Georgia. Whoa–let’s stop it there for a sec. . . . A “radical new reactor design?” Somebody’s being a good little scribe this Christmas. As previously discussed, there is nothing radical about the AP1000–it’s a tweak on the generations-old pressurized water reactor design that theoretically would allow the core to avoid a meltdown in the event of a total loss of AC power. . . .
Well, for 72 hours, anyway. After that, the manufacturer–in reality the Japanese owner of Westinghouse, Toshiba–says something about it taking only “minimal operator effort” to avert disaster. Keep in mind that the AP1000 was designed well before the Japanese earthquake and tsunami that started the ongoing Fukushima disaster, but this approval, of course, comes well after. Designers of the AP1000 assert that gravity and convection will serve to keep reactor cooling functioning even if systems are disabled as they were at Fukushima. That assertion is predicated on the storyline that the Daiichi plant’s safety systems survived the massive quake, and only ran into trouble when the tsunami flooded and disabled the diesel backup generators that powered cooling systems for the reactors and the spent fuel pools. First, it is by no means established fact that Fukushima’s cooling systems survived the earthquake undamaged. Reports from the Japanese government and TEPCO, Fukushima Daiichi’s owner-operator, have gone back and forth on this matter. It would be naturally beneficial to nuclear advocates to go with the story that the quake did nothing to the reactor and its safety systems. But given the visible damage to the plant and the surrounding area, and given the profound leaking of cooling water that has continued seemingly unabated from the earliest days of the disaster, it is hard to believe all pipes, tubes, couplings, fittings, vents and valves–not to mention the containment vessels and tanks themselves–remained watertight after the massive temblor. Just days before the earthquake in Japan, Rep. Markey wrote a letter to the NRC urging the Commission not to approve the Westinghouse AP1000 design until serious safety concerns were addressed. One of NRC’s longest-serving staff, Dr. John Ma, had warned in NRC documents that the reactor’s containment could shatter “like a glass cup” due to flaws in the design of the shield building if impacted by an earthquake or commercial aircraft. The shield building has the critical safety function of preventing damage to the reactor that could cause fuel meltdowns and radiation releases. Note, Dr. Ma has been with the NRC since its inception, and this was the first non-concurrence dissent of his career. The NRC acknowledged this concern and asked Westinghouse for a response. . . and the response was, essentially, “nah-ah.” A response that has now proven good enough for the agency tasked with assuring the safety of America’s nuclear reactors. So, it theoretically would be great if the AP1000 were able to survive without melting down through three days without electrical power–though it should be noted that three days wouldn’t have really saved Fukushima’s bacon (even if it had remained intact) given the devastation to the region’s infrastructure. But that semi-sunny selling point on the AP1000 assumes that there would still be a reactor containment building to cool. It is the kind of “what could possibly go wrong” assumption that has tripped up nuclear power generation in large and small ways throughout its history–and it is stunning that, especially in the wake of the Japanese crisis, this cavalier attitude continues. But perhaps it is not so surprising when we consider just why the AP1000 has such a novel/brittle containment building: it is supposedly cheaper to build. The AP1000 is slated to have a smaller footprint with fewer components, but still use off-the-shelf, previous-generation parts. Most notably, the design uses under a fifth the amount of concrete and rebar, compared with existing PWRs. In an unusual step, the commission waived the usual 30-day waiting period before its approval becomes official, so its decision will be effective in about a week. That moves the utilities closer to the point where they can start pouring concrete for safety-related parts of the plant. The decision also moves the industry toward the first test of a streamlined procedure in which the commission will issue a combined construction and operating license. Up to now reactors had to obtain a construction license and then undergo a long wait for an operating license, resulting in expensive delays in starting up reactors that had essentially been completed. And it is important to mention that the approval of this accelerated process came over the objections of NRC Chairman Gregory Jaczko–who just last week faced both House and Senate panels questioning his leadership style–but the certification of the AP1000 design did not. In fact, at the same time news of the Jaczko witch hunt was blocking out the sun, the NRC chair was actually working with other commissioners–the ones who sent a letter to the White House saying Jaczko was impossible to work with–to secure the unanimous OK for the new reactor. It is not the first time those wary of a nuclear renaissance had been presented with the dilemma of both praising and cursing Jaczko. In fact, just last week, on December 15, Jaczko was the only vote in support of a move to make all recommendations of the post-Fukushima Near-Term Task Force report mandatory for the “adequate protection” of nuclear power plants. The four other NRC commissioners asserted that it was “premature” to make such a rule–and so Fukushima’s lessons continue to go unlearned, over Jaczko’s protestations and lonely protest vote. But it is just this sort of nightmare-inducing nuclear mollycoddling that should convince Jaczko that the process he has often praised is deeply flawed. He cannot advocate for new safety rules one week and then grant license to the industry that works so hard against those rules the next. Not if he really wants change; not if he really cares about public safety.